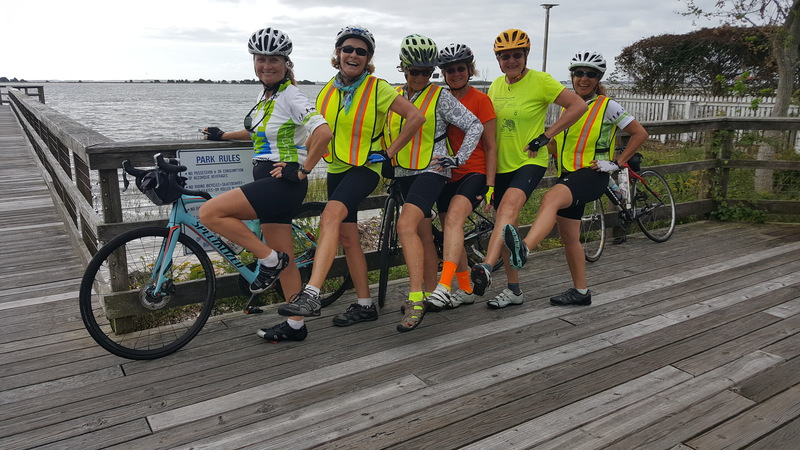 40 cyclists convened in Wilmington, NC, along the Cape Fear River – with anticipation of Day 1 – a 66-mile ride that included a 4 mile Ferry Crossing over the mouth of ‘The Fear. After checking into our hotels, one hand dragging luggage and the other holding a bike, some of us meandered through Wilmington’s Riverwalk, an annual festival that brought out the locals, the outta-towners, and wide-eyed bicyclists, who were thrilled that Wilmington put on such a party just for us. There were unlimited food options, especially if you have a taste for pork — pulled, twisted, sliced, congealed and more options I never knew existed, and funnel cake, loaded with sugar and with an option to buy two for a price that does not dent the wallet. And, if you want to wear a sign that broadcasts that you live in a land far far away, ask about vegan or vegetarian choices. 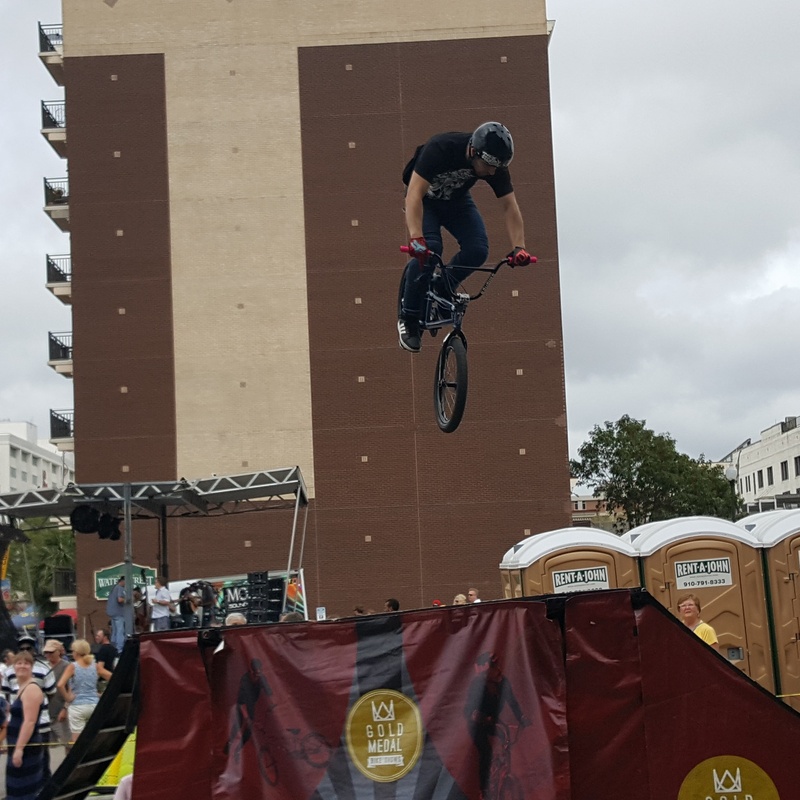 The excitement builds along the river, with stunt riders on half sized bicycles with double sized tires flying 20 feet into the air, inspiring a whole young generation to stare in awe, and leaving a whole older generation to wonder if they might prefer to just stay on the ground. For some of my bike mates, getting settled into Wilmington meant they would ride their bicycles for a 19 Hurricane-Matthew-makeup-mileage tour to ensure that last year’s hurricane didn’t leave a gap in the overall adventure. Due to some direction faux-pas, or pre-trip confusion, or a need to over-achieve, some members managed to turn that 19 mile trip into a 60 mile trip. But nothing to worry about for this gang, as they are built from a blend of pro-athlete stock, and the extra miles, getting lost, battling traffic only makes for some great war stories over dinner. Sunday has arrived, and it’s time to say goodbye to your car for a week, and travel via bicycle. Not so fast. The Ferry wasn’t working, being a Sunday and all, and all plans changed to cross ‘The Fear using the bridge crossings mere miles from our hotel accommodations. Hold on, Nelly. We ride bicycles, not cars. There are grates in the bridge, the kind of grates that flow in the direction of our skinny bike tires, the kind of grates that would keep your bike stuck in the bridge, watching the water flow underneath, staring, stuck at ‘The Fear. Now, that’s no way to start our tour, so the ECG staff arranged to shuttle us across the unfriendly bridge. Once on the southern shores of ‘The Fear, we adjusted our headlights, backlights, helmet lights, brightly colored vests, and the ride began. There’s this hurricane called Nate, that is making lives miserable along the Gulf of Mexico coast. Somehow Nate is also in North Carolina. Making the atmosphere humid, hot, filled with winds — always a headwind. The morning ride along the southern side of ‘The Fear was a delightful ride – low volume roads, large shady trees, and one couldn’t find an issue even if it existed — including Nate and it’s heat wave — because we were on bicycles. Stopping for some interesting scenery, photo ops because it seemed right, and relearning not to step on one of those fire-ant sand-homes. We met a local, also on bicycle, who shared with us the best places to get free food on Sunday — a fish fry, and more ‘fry opportunities should we be interested. We thanked him for the local knowledge, and all that talk about food reminded us it was time to reach into our bike bags for snacks, and before we knew it we had arrived in Southport. Here we stopped for more photo ops, watched the sailboats navigate the ICW, and someone said ‘time’, so we all hopped back on our bicycles. 30 miles down, and another 30 to go. 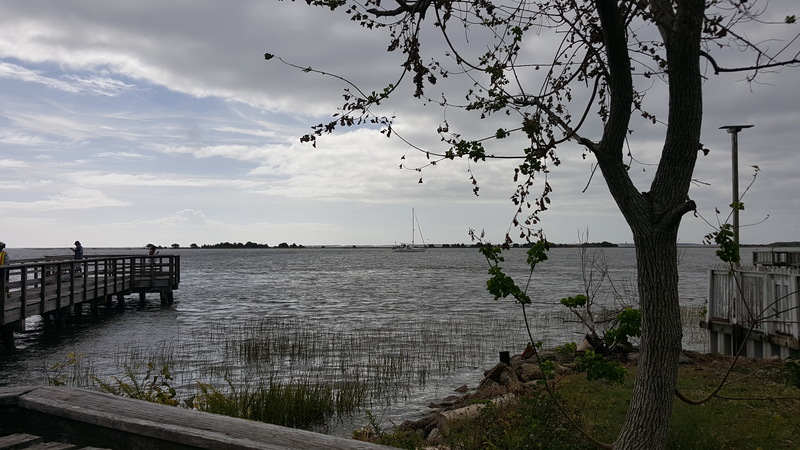 Departing Southport, we found ourselves on high volume, no shoulder roads, and our group naturally became a tight peloton, and managed to get beyond the scary roads, only to find ourselves on an equally scary road for different reasons. High speed, barely any shoulders and animals that failed to safely cross the road. Large roadkill, fresh with scents that fused into your nose and took miles to lose. And old roadkill, that should have served as a warning to any animal considering a crossing. Don’t do it, stay on that side of the road. And we rode, and rode, our water bottles emptied, and the heat and humidity wouldn’t stop until finally along this business-desolate stretch of road, we discovered an oasis. Our oasis came in the form of a Holiday Inn Express, and we were desperate for water. We met Kathy, the Manager and life was suddenly good again. She invited us in to cool off in the air conditioning, pit stops for all, and cold water, with ice. 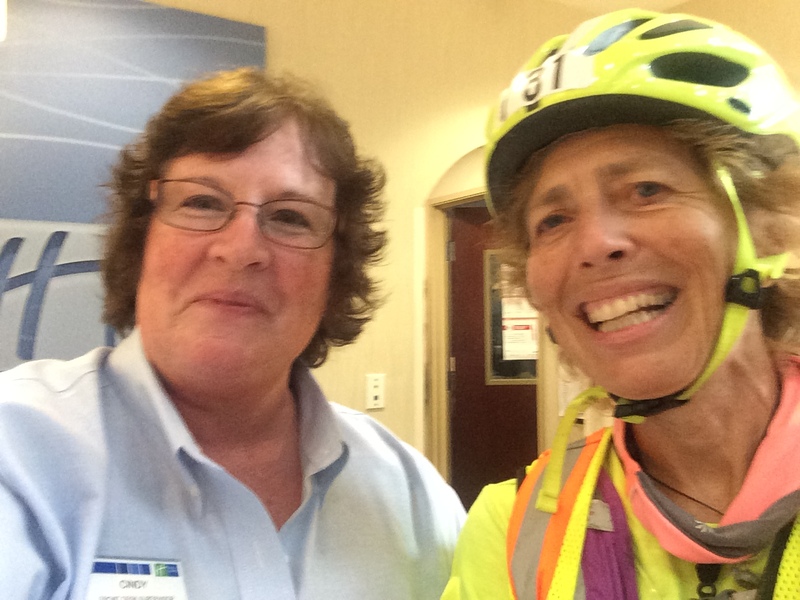 Thank you Kathy, for your huge heart, your unquestioning humanity and being the talk of our bicycle group – likely for the entire tour. With cold water, and a brief reprieve from the heat, we said goodbye to our new friend, Kathy, and rode on. Avoiding big trucks, avoiding roadkill, and breathing deep and happy when we encountered a low volume road. Our final turn, meant we had to climb the one and only hill. The hill to cross the bridge over the ICW. 65 feet in the air, with no shoulder and a sign instructing bicyclists to walk, we opted to cross fast and take the entire lane. 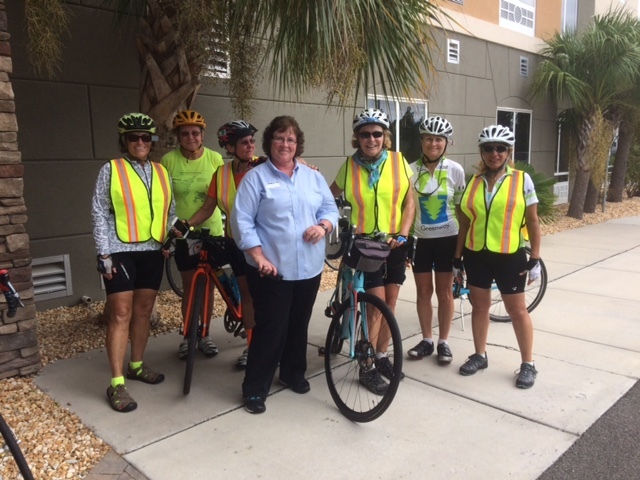 Arriving in Ocean Isle Beach, we completed our ride, mostly unscathed (two riders in our group took a dive into a ditch to avoid a car encounter, or to get a close up photo of an alligator? ), with enough time to walk the ocean, take a dip in the pool, indulge on hand-dipped ice cream, and pinch ourselves reliving the day saying “wow – what an amazing ride”.